A group of displaced Kashmiri Pandits today observed 'black day' to commemorate the July 13, 1931 riots against the community in the Valley and demanded better security, especially in the wake of violence following the killing of Hizbul commander Burhan Wani. "The situation has not changed from 1931 till today. 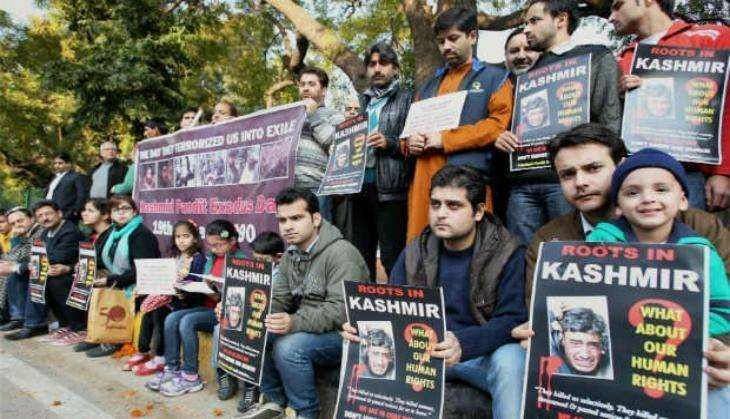 Kashmiri Pandits were attacked then and even today, in 2016, they are attacked," Ravinder Raina, president, All State Kashmiri Pandit Conference (ASKPC) said. He demanded better security for the community in Jammu and Kashmir after he alleged that stones were pelted at the houses of Kashmiri Pandits following the death of the Hizbul commander. Anoop Bhat, coordinator, Roots in Kashmir (RIK), said, "Whenever the majority population of the Valley has any issue with the ruling dispensation, the minority community faces the brunt." "The July 13, 1931 riots, 1986 South Kashmir riots or the exodus of Kashmiri Pandits are the prime examples of how the Kashmiri Pandit community has constantly lived in fear of life and honour," he said. He added that Kashmiri Pandits currently living in the state are in dire need of a "fool proof security" and that the Centre should rethink its composite township model.